InSight sent a “touchdown image” to NASA on November 26 2018 embarking the first landing of a spacecraft on Mars after six years (Of course, you are awesome too Curiosity) and for the eighth time in total. Launched on May 5th 2018, InSight traveled a distance of 458 million km and landed on Mars yesterday at 19:52 UTC. It most hit the bulls eye and landed on Elysium Planitia near the Martian equator exactly as planned and sent a “A-Ok” signal to NASA after seven minutes to confirm its safe landing. 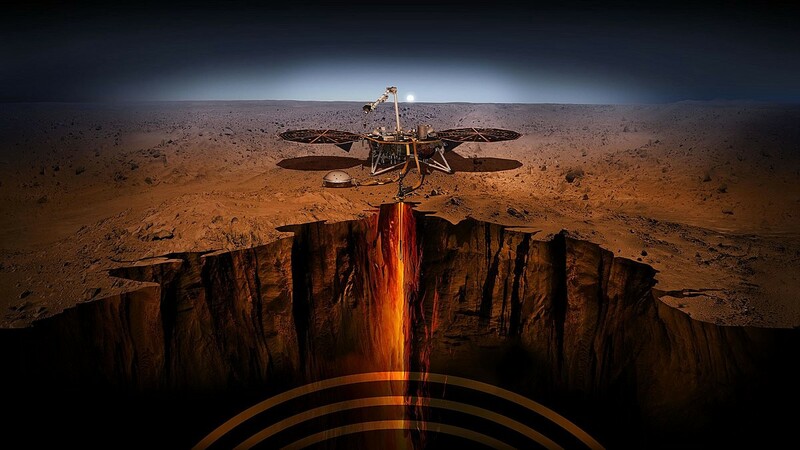 InSight — an abbreviation for Interior Exploration using Seismic Investigations, Geodesy and Heat Transport, manufactured by Lockheed Martin Space Systems and managed by NASA’s Jet Propulsion Laboratory. The spacecraft also carried two microsatellites called Mars Cube One, these were a test of a new miniaturized communication and navigation technologies which proved efficient as it provided real time updates to Earth while InSight took its leap and landing. This achievement (CubeSat) not only was for effective communications but also provides positive assurance for deep space endurance. Now to the question — why? InSight’s major mission is to study the internal structure and rotation of Mars. This will be done by burrowing a heat probe and deploying a seismometer to carry out various radio science experiments. This will not happen anytime soon as it will take atleast few months for the probe to find a best location to place its equipments and install them. Like any other mission it has its own purpose, this one’s is to get answers about “marsquakes” that will help understanding the planet better. If I start explaining its complements here, people will simply close this article. So, for those who wants to know more about it, read it here (payload). To summarize, this mission is all about learning Mars’s core evolution and its history — what and how Mars was shaped into what it is now. I will keep this blog updated as InSight’s exploration and findings begin… But for now, check out the InSight’s view as it shares an image from its new home. Originally published at lifespaceandthelot.com on November 27, 2018.